I have recently discovered this gorgeous little site - Tea & Ceremony - which is full of stunning paper goods - cards, prints, and cutesy gifts - perfect for Christmas, Birthdays, and any gift-giving occasion. All of the items are designed by the very talented Sandra Igbodo and all her orders are assembled, packed and posted by her at home. Her designs are bold and colourful, full of fun and inspired by Scandinavian design. I truly fell in love with her designs, and am so glad to have discovered this little gem of a website. I love to buy cards and gifts that I know aren't likely to be duplicated - there's something quite sad about receiving multiple copies of the same design card at Christmas/Birthdays, and I know that if I buy from Tea & Ceremony it will be something funky and different for the recipient. Sandra sent me some of her gorgeous Christmas cards, and I cannot WAIT to send them off to friends and family. On average I send around 50 Christmas cards each year, and I love them to be different, fun and sometimes personalised (that's another post for another day! watch this space..!). 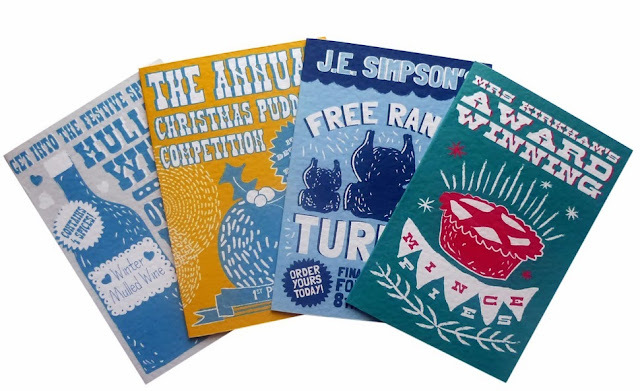 Sandra's 'Festive Food' cards are right up my street - I'm such a foodie, and as you know I love that vintage look - so this set of 4 cards really hit the spot! 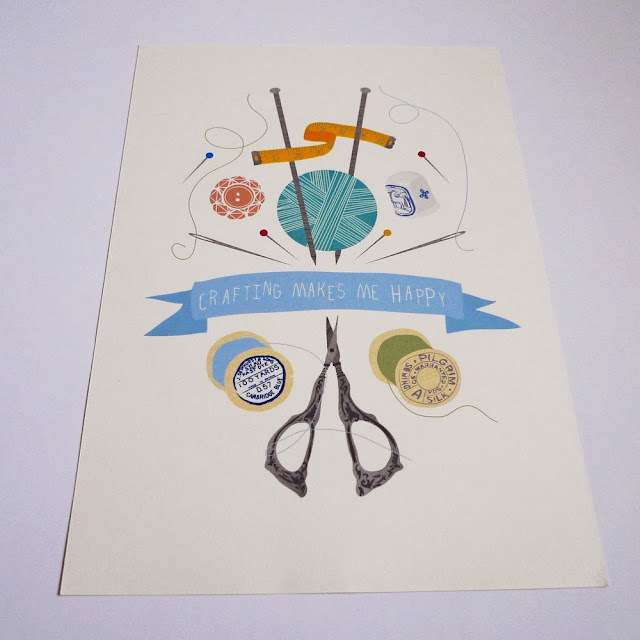 Sandra has been extra-lovely and sent me a gorgeous print to giveaway to one of my lucky readers. 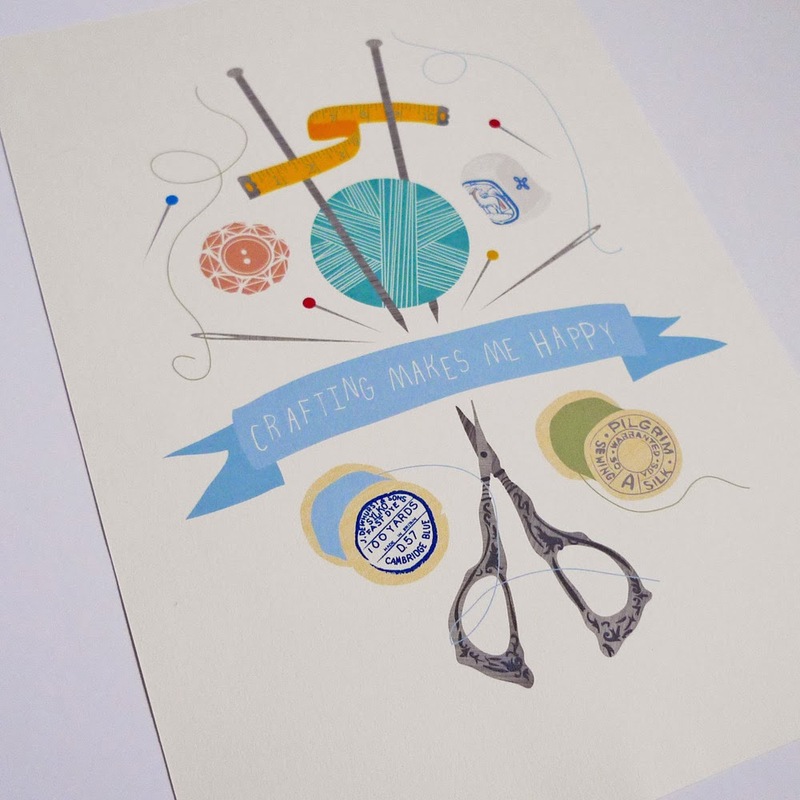 The print is called 'Crafting Makes Me Happy' and is worth £10.00. It measures 21cm x 29.7cm. The 'Crafting Makes Me Happy' print features an illustration of assorted sewing and knitting tools including knitting needles, vintage cotton reels, antique scissors and a decorative thimble. The illustration is digitally printed on smooth off-white 220gsm cartridge paper that is 100% acid free. This print will be packaged in a protective plastic sleeve and shipped in a board-backed padded envelope to reach you in perfect condition. The print is a perfect gift for the avid crafter, or lovely to keep for your own home. To enter just use the Rafflecopter widget below! The Christmas Card Collection is great and so different! It's all gorgeous! I've never got over my childhood badge collecting obsession so my absolute favourite has to be the Christmas Badge Collection http://www.teaandceremony.co.uk/product/christmas-badge-collection followed closely by the cat badges. Absolutely lovely - thanks for the introduction to them! I love the mulled wine poster....just perfect for the upcoming season! 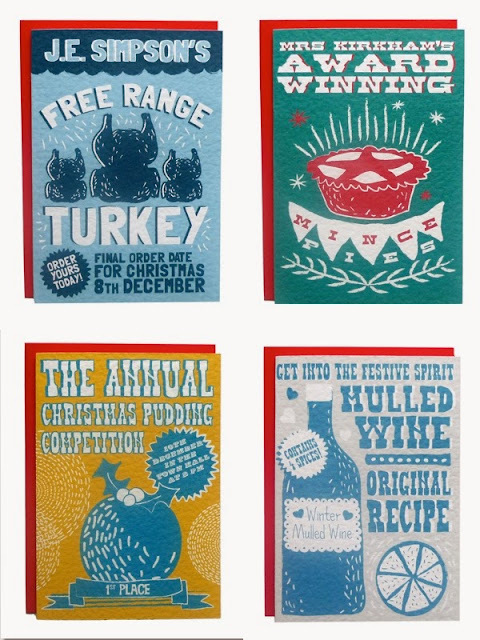 Love the christmas card collection. I love the Cat Badge Collection. The DIY paper craft kit! I love the Christmas mix tape card, it reminds me of my youth! These are a bit different. The whole site is great. I am a great cat lover so these would be fab! It's a fantastic place! I was here for a party last Friday and the service was amazing. Many thanks to their great staff, those guys deserve a round of applause.